Zero VOC Paint is water based interior wall emulsion with a rich smooth finish No VOC and odour less. It has excellent wash ability and stain resistance properties. Typical household paint contains up to 10,000 chemicals, of which 300 are known toxins and 150 have been linked to cancer. Zero VOC Paint can be redefined as Health paint with decorative properties to bring life to your walls without affecting the lives of your loved ones. 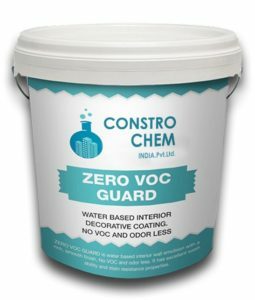 It is called Zero VOC Guard. ZERO VOC GUARD is designed for application on the interior, new and previously painted surfaces such as plaster, gypsum plaster, cement rendering, concrete, hardboards etc.